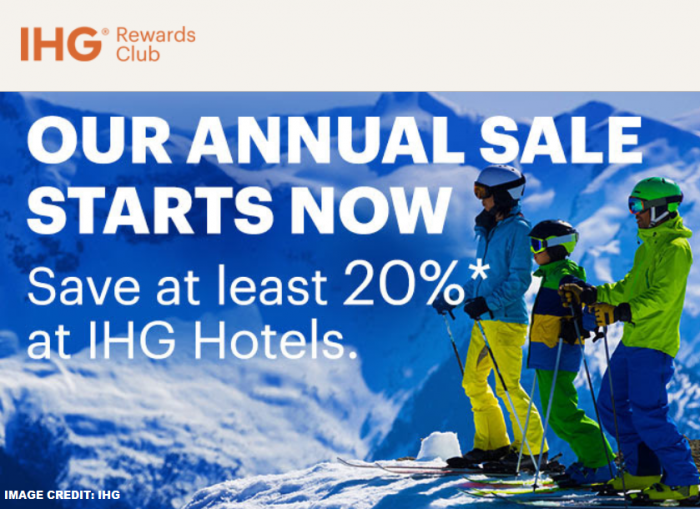 IHG Rewards Club has launched new “IHG Annual Sale” that promises minimum 20% off discount for stays in the US at participating properties through March 31, 2019. The offer is available for bookings until January 7, 2019 and is both prepaid and non-refundable. Note that this rate is not necessarily available on all dates and some hotels may have minimum stay requirement in place. Worth having a look at rates offered under this sale and book if they are good. Just make sure that your plans are set in stone as these are non-refundable and non-changeable. The Annual Sale promotion is valid only for bookings made from November 1, 2018 through January 7, 2019, using the “IHG Annual Sale” rate. All bookings must be consumed from November 4, 2018 through March 31, 2019 at participating IHG® hotels. The discount is at least 20%* off the Best Flexible Rate. Booking must be made at least three (3) days in advance and requires non-refundable, full pre-payment for the entire stay at the time of booking. Discount varies by hotel and blackout dates apply. Rooms are subject to availability and certain room types may be excluded. Hotel policy varies in regards to the minimum length of stay required and number of guests allowed per room. Not applicable with other discounted rate promotions. Not applicable to group bookings. Hotel-specific early departure fee applies. Venetian, Palazzo, Kimpton® Hotels & Restaurants, Holiday Inn Club Vacations® and IHG® Army Hotels are excluded from the promotion. Valid on US properties only.